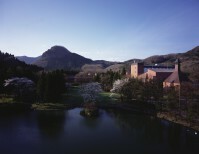 It is in the valley of Miyagi at the confluence of Nikkawa and Hirose rivers that Masataka Taketsuru (founder of Nikka) decided to locate its second distillery after three years of research. Founded in 1969, the distillery Miyagikyo is located north-east of the Honshu island in a hilly area covered with forests of maples and conifers. Volcanic soils filter water of the naturally occurring sources that are known for their purity. Malt and grain whiskies produced in Miyagikyo are full of sweetness, elegance and complexity.